CAR DETAILING TIPS & TRICKS DONT HAVE A DASHBOARD CLEANING - ProudMummy.com the Web's Community for Mums. 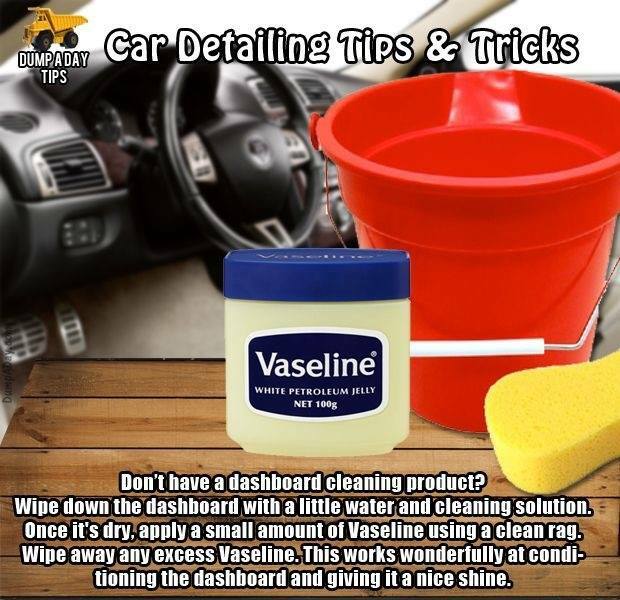 CAR DETAILING TIPS & TRICKS DON'T HAVE A DASHBOARD CLEANING PRODUCT? WIPE DOWN THE DASHBOARD WITH A LITTLE WATER AND CLEANING SOLUTION. ONCE IT'S DRY, APPLY A SMALL AMOUNT OF VASELINE USING A CLEAN RAG. WIPE AWAY ANY EXCESS VASELINE. THIS WORKS WONDERFULLY AT CONDITIONING THE DASHBOARD AND GIVING IT A NICE SHINE.